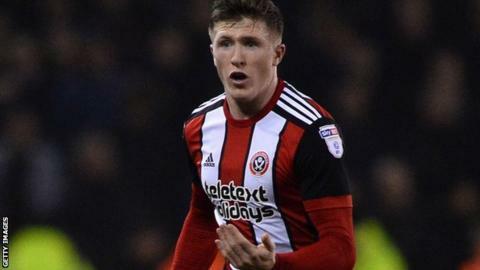 Sheffield United continued their push for a Championship play-off place with a narrow win over QPR. The hosts took the lead when defender Richard Stearman finished after Leon Clarke had flicked on Mark Duffy's corner. John Lundstram made it 2-0 from Billy Sharp's cutback just after the break. Luke Freeman pulled a goal back for the visitors with a good shot from distance but, despite late pressure, they could not find an equaliser. Back-to-back league wins have moved Chris Wilder's men to within one point of the top six. The Blades looked to be cruising to victory when Lundstram doubled their advantage after the interval but nearly had to settle for a point. Matt Smith twice went close to levelling for the hosts, with home keeper Jamal Blackman forced into a late save from the striker's header. The Blades visit struggling Hull City on Friday, while 15th-placed QPR are back in action when they host Nottingham Forest on Saturday. "I thought we were outstanding. When we went forward we were great and we've beaten a decent side. "The last 20-25 minutes wasn't our greatest performances but if you have to see it out you have to see it out and we did enough in the first 60 minutes. "We were the dominant side and I think it's a big win for us tonight." "We have got to stop making mistakes. We started well and caused them problems but unfortunately we are not seeing it through. "I'll take the performance, spirit and fight-back all day long. "I don't want to criticise my lads as they kept going and had other chances. It is tough at the minute but the young lads have got to learn about being away from home and what it is all about. "I think we are getting closer to what I want." Match ends, Sheffield United 2, Queens Park Rangers 1. Second Half ends, Sheffield United 2, Queens Park Rangers 1. Foul by Josh Scowen (Queens Park Rangers). Daniel Lafferty (Sheffield United) wins a free kick in the defensive half. Offside, Sheffield United. George Baldock tries a through ball, but Clayton Donaldson is caught offside. Clayton Donaldson (Sheffield United) wins a free kick on the right wing. Corner, Sheffield United. Conceded by Joel Lynch. Attempt blocked. Ryan Leonard (Sheffield United) right footed shot from outside the box is blocked. Assisted by Daniel Lafferty. Attempt saved. Matt Smith (Queens Park Rangers) header from the centre of the box is saved in the top centre of the goal. Assisted by Luke Freeman with a cross. Substitution, Queens Park Rangers. Eberechi Eze replaces Massimo Luongo. Substitution, Sheffield United. Daniel Lafferty replaces John Lundstram. Clayton Donaldson (Sheffield United) wins a free kick in the defensive half. Substitution, Queens Park Rangers. Bright Samuel replaces Conor Washington. Corner, Sheffield United. Conceded by Nedum Onuoha. Lee Evans (Sheffield United) is shown the yellow card for a bad foul. Foul by Lee Evans (Sheffield United). Massimo Luongo (Queens Park Rangers) wins a free kick in the attacking half. Foul by Ryan Leonard (Sheffield United). Jake Bidwell (Queens Park Rangers) wins a free kick in the defensive half. Substitution, Sheffield United. Ryan Leonard replaces Mark Duffy. Substitution, Sheffield United. Clayton Donaldson replaces Billy Sharp. Jack O'Connell (Sheffield United) wins a free kick in the defensive half. Attempt missed. Jake Bidwell (Queens Park Rangers) left footed shot from outside the box is high and wide to the left. Attempt missed. Paul Smyth (Queens Park Rangers) left footed shot from the centre of the box misses to the left. Assisted by Pawel Wszolek. Substitution, Queens Park Rangers. Paul Smyth replaces Alex Baptiste. Attempt missed. Matt Smith (Queens Park Rangers) left footed shot from the centre of the box is high and wide to the left. Assisted by Luke Freeman with a cross. Foul by Mark Duffy (Sheffield United). Offside, Queens Park Rangers. Massimo Luongo tries a through ball, but Matt Smith is caught offside. Goal! Sheffield United 2, Queens Park Rangers 1. Luke Freeman (Queens Park Rangers) left footed shot from outside the box to the bottom right corner. Assisted by Massimo Luongo. Attempt missed. Luke Freeman (Queens Park Rangers) left footed shot from outside the box is high and wide to the left. Assisted by Josh Scowen. Billy Sharp (Sheffield United) wins a free kick in the defensive half. Foul by Joel Lynch (Queens Park Rangers). Offside, Sheffield United. Billy Sharp tries a through ball, but Leon Clarke is caught offside. Corner, Sheffield United. Conceded by Jake Bidwell. Attempt missed. John Lundstram (Sheffield United) right footed shot from outside the box misses to the left. Assisted by George Baldock. Richard Stearman (Sheffield United) wins a free kick on the left wing.